BayaniJuan, ABS-CBN Foundation’s resettlement site located at the foot of Mt. Kalisungan in Calauan, Laguna, is home to families who once survived living at the banks of filthy esteros of Manila. 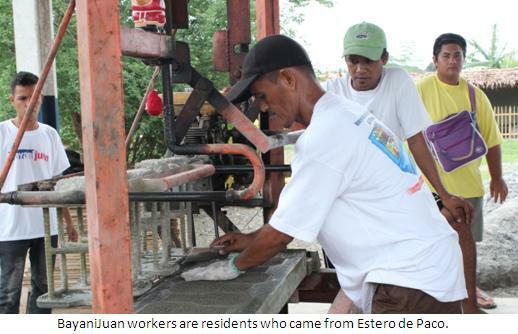 In 2009, in compliance with the Pasig River clean up drive, informal settlers from Estero de Paco voluntarily agreed to relocate with hopes of a better life for their families. They found in BayaniJuan, a home they could call their own. 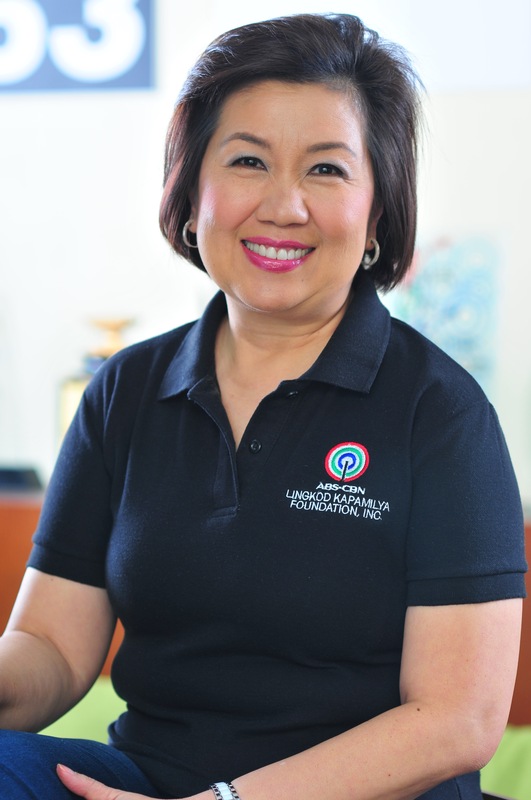 As Ms. Girlie Aragon, BayaniJuan’s Program Director aptly said, “ito ay isang panimula sa ‘mainstream’ at hindi na sa gilid ng estero”. BayaniJuan paved the way to bayanihan. Various sectors are pulling their resources together to create a sustainable community for these relocatees. One of them is the United Bank of Switzerland which funded the initial capital needed for BayaniJuan to have its own Material Recovery Facility (MRF). MRF is a facility designed to receive, sort, process and store compostable and recyclable materials efficiently and in an environmentally-sound manner. While they are helping the environment, BayaniJuan residents benefit in this endeavor as they receive grocery items like rice and noodles in exchange for plastic waste. The items they redeem depend on the weight of the plastic they trade. 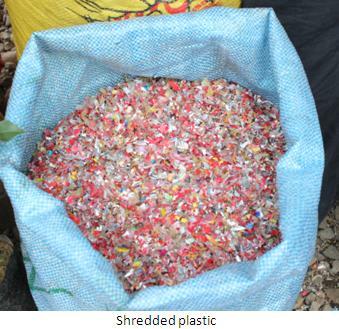 The plastic wastes are then used for the manufacture of pavers and stepping pads which the community use within BayaniJuan and sell to their corporate sponsors. The pavers are made of 90% cement and 10% shredded plastic. 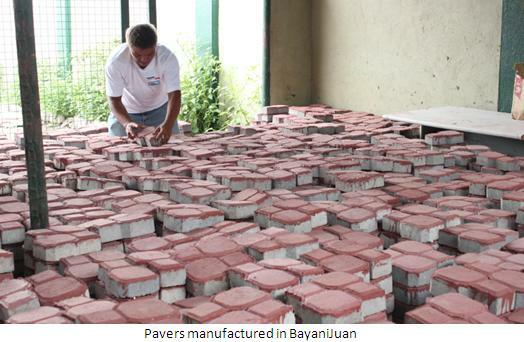 The first client of BayaniJuan’s paver production was Sunlife Financial Corporation. 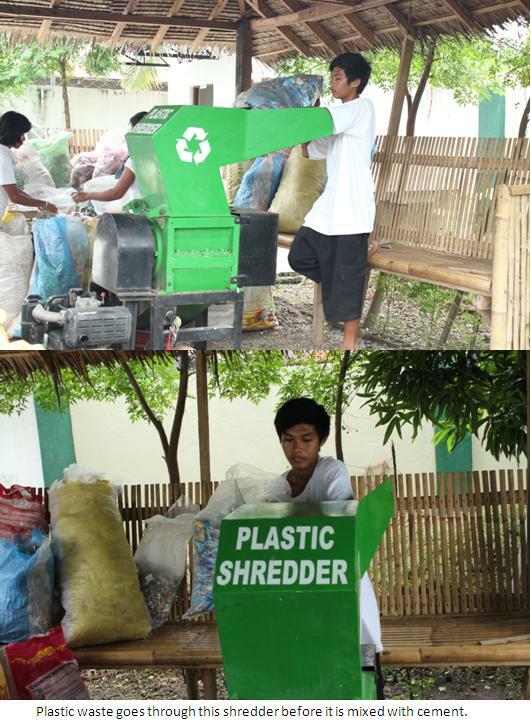 BayaniJuan’s MRF which started operation in 2011 currently employs 15 relocatees. The number of workers will soon increase as BayaniJuan receives additional equipment from the Lopez Group Foundation.